The 3rd quarter ended. RationalMove’s performance in Q3 was 2.46%. I made about another 2% in September by trading SPY ETF, but that was intended as mid-term trade, so I did not include in this short-term trading performance report. Year-to-date performance is 11.64%. I think trading will generally remain very difficult in Q4. In the first day of the Q4, EURJPY overcame 114.75. 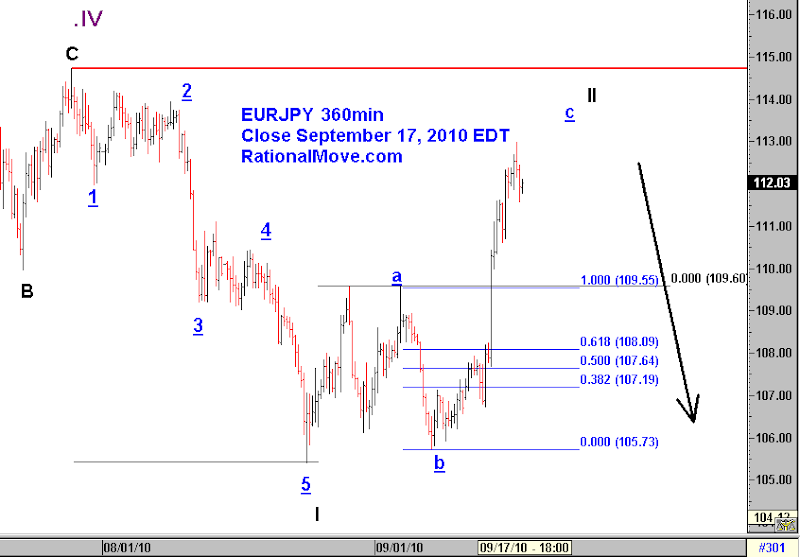 So the Elliott count of EURJPY I showed in the previous post became invalid. Things remain very uncertain, but if I trade anything, I started to prefer long AUDJPY. I would buy at the dip, and prefer patiently hold it to gain on the swap rate interest, rather than trying to ride on the high volatility wave. But as in the first rule, I will keep the clear stop loss defined on each trade. Here is daily. I will patiently wait until I see black 2 before bidding. 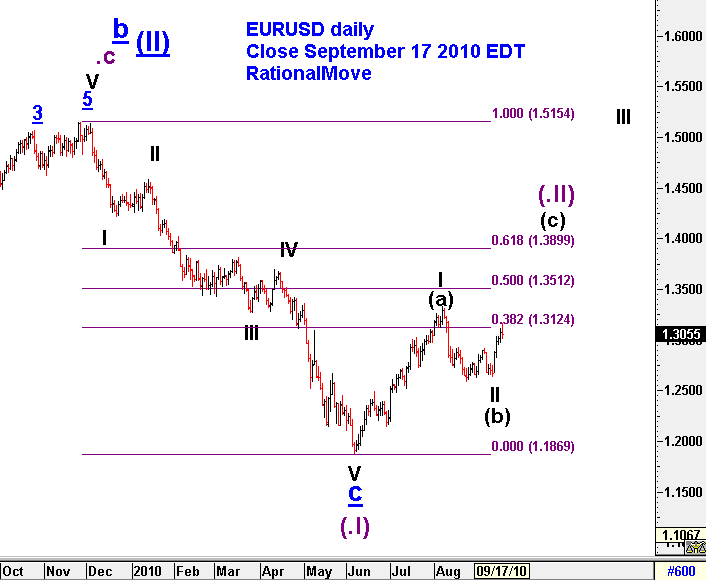 I had to reject the Elliott wave counts of the last two posts on EURJPY and XAUUSD, but I have not changed my mid to long term view. 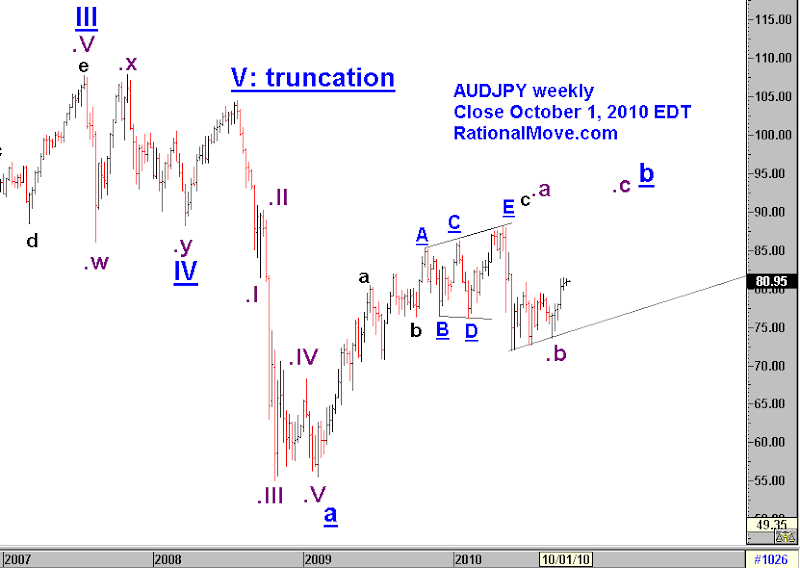 Using high correlation of AUDJPY and S&P500, I made a profit by long SPY in September (I already closed). Entry was 105.5, and exist was 113.05. This was supposed to be mid term trade, so it was not been reflected to the capital growth rate that is only meant for short term strategy. So, no P/L for September. I’m expecting less opportunities at least for the rest of the month, and possibly until November. 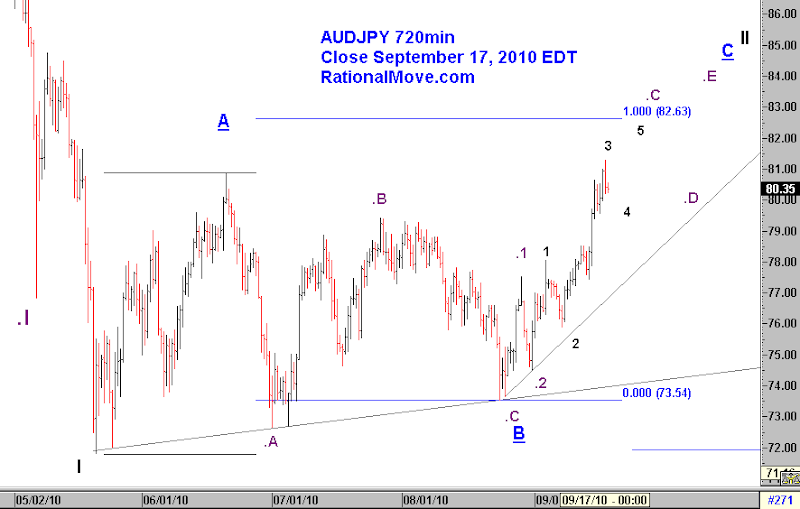 Here are charts of EURUSD, EURJPY, AUDUSD, and AUDJPY with links to the recent post on the cross currencies. EURUSD daily. My last comment is here. EURJPY 360min. My last comment is here. I stay bearish unless 114.75 trades. 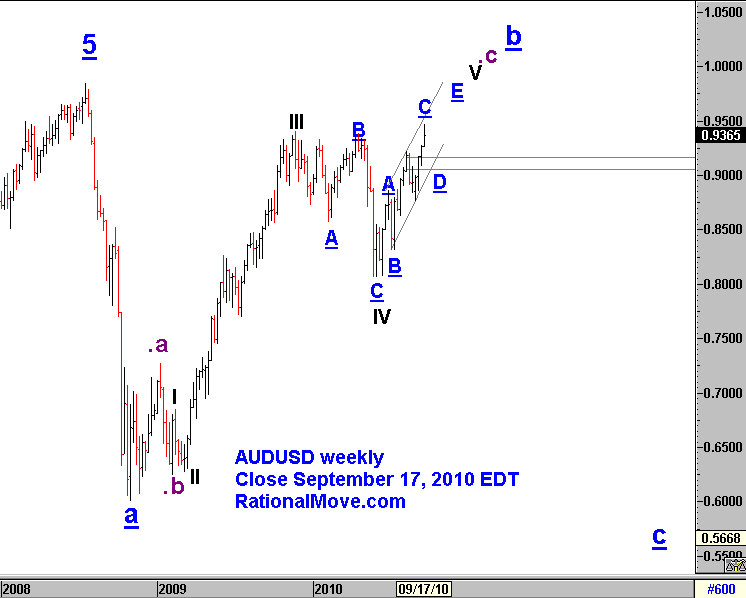 AUDUSD weekly. My last comment is here. The EW count has been changed a bit. AUDJPY 720min. My last comment is here. Update (September 19, 2010): Purple .C, .D, and .E are typo they should have been .3, .4, and .5. Update (8:00am, September 15, 2010): The wave count does not hold anymore. This is analysis has been rejected. I showed the bearish forecast of Euro against Japanese yen just a month ago. Now things are getting materialized. I can clearly count 5 waves down to August 24 from the purple .IV to black I. Then a clear flat wave ending at II. Concern about Euro zone resurfaced over the Labor day long weekend for US. I will wait for a rebound to blue underlined 2. Then I will set a stop short entry order. It will be as early as tomorrow. The target price would be 100.28 if this wave III travels as long as black I, or 94.52 ideally if it travels 168%. Now just a couple of notes on other currency pairs. 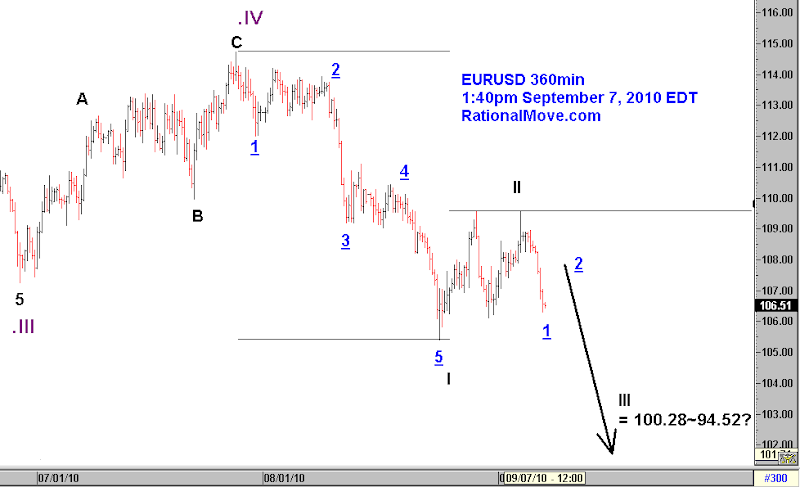 I’m bearish EUR against JPY, but I’m still not certain EURUSD as I showed my view here. 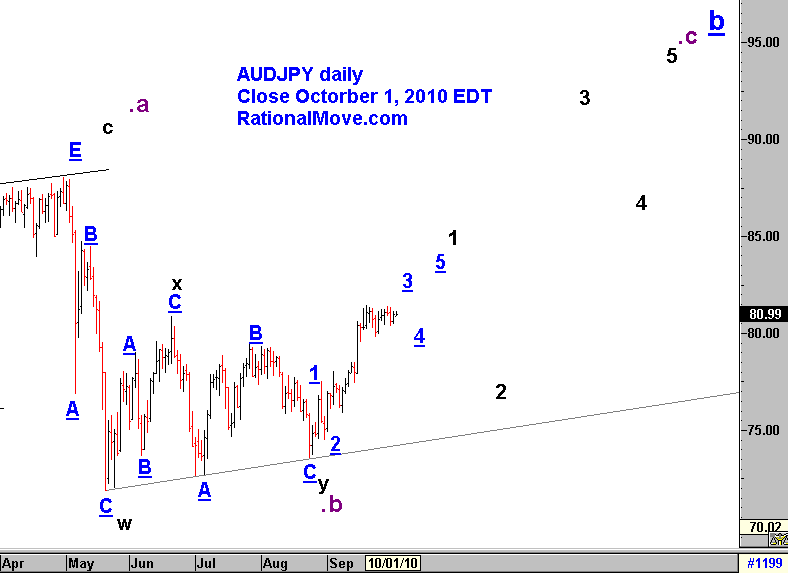 I also showed a bullish view on AUDJPY only for September. Because of the high correlation of AUDJPY with S&P 500, I bought SPDR S&P500 ETF (SPY) at 105.50 for a mid term holding as I noted on Twitter on August 31. So far it’s been a good move although I’m expecting a sluggish move by a potential ending diagonal towards 113 on SPY and 82.63 on AUDJPY, and it would take great patience and courage with a clear stop loss definition. In other words, setting the stop loss and forget about it for a while. So, I’m not doing a short term trade on this. As I always say, my mid term positions are still an experimental strategy that is different from more establish short term strategy. To avoid mixing up the result of two strategy, I’m not including the mid term strategy results to the performance report whether I win or lose. The performance report is purely from short term trading.